RideKC Bike is rolling out a new fleet of smart, electric-assist Ride KC Bikes (powered by Drop Mobility) this spring, with new hubs coming online. Start and end your trip at any hub. Bikes are being added throughout Spring 2019. Check the app to see the latest bike and hub locations. Bikeshare bicycles that are not electric-assist are also available through RideKC Bike. Learn more about RideKC Bike, including how to check out the bikes and where to find them. Sign up for your Bike + Bus Pass at kc.bcycle.com. Once at the website, click the Join Now button and select the option to "Join as a Bike + Bus Pass user." Users who already have a monthly bus pass and want to upgrade to the Bike + Bus Pass must re-sign up through the Kansas City BCycle website once their current month pass expires with RideKC. Buses throughout the Kansas City area are fitted with bike racks, giving our passengers another advantage to using public transportation. And better yet, it’s free. There are also stationary bike racks at various bus stops across the region if you need to leave your bike behind when you board the bus. Putting your bike on a rack is easy. Read our instructions or watch a video below to learn how to load your bike. 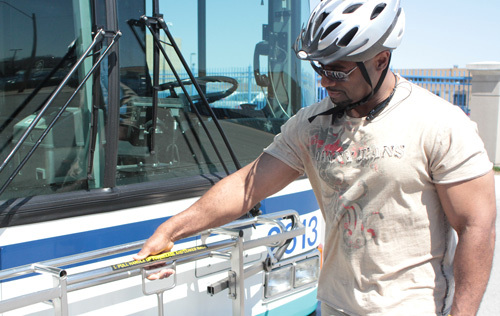 You are responsible for loading and unloading your bike without bus operator assistance. Each rack holds two bikes and is available on a first-come, first serve basis. If the rack’s full, please wait for the next bus. If there’s an accident, you must get permission from the operator or transit authorities before removing your bike. Motor-powered bikes, mopeds, tandem bikes, tricycles, bikes with training wheels and bikes with trailers can’t be loaded onto the bike racks. 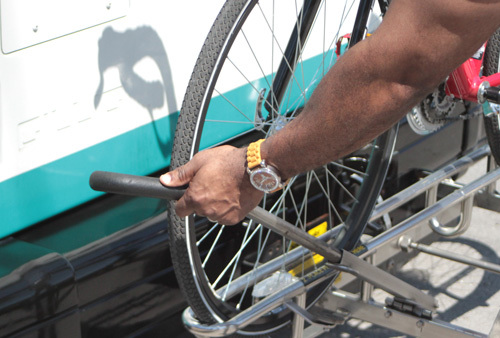 Transit agencies are not responsible for lost, stolen or damaged bikes. Loading and unloading your bike is simple. Instructions are also printed on the bike racks. 1. When waiting at a RideKC stop, be sure to get off your bike and flag down the bus. Wait for the bus to come to a complete stop. 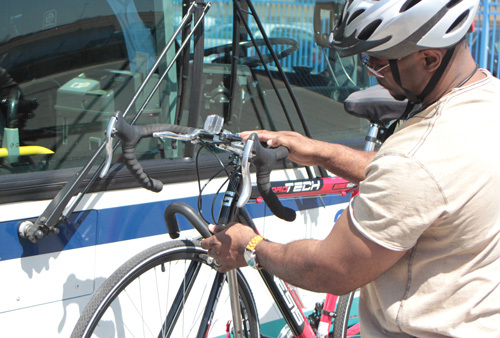 Any loose items, such as air pumps, bags, etc., should be removed from your bike before the bus gets to the stop. 2. With one hand, squeeze the rack handle and lower the rack. 3. Load your bike into the bike slot. If both slots are open, load your bike in the slot nearer to the bus. Wheel slots are labeled for front and back tires. 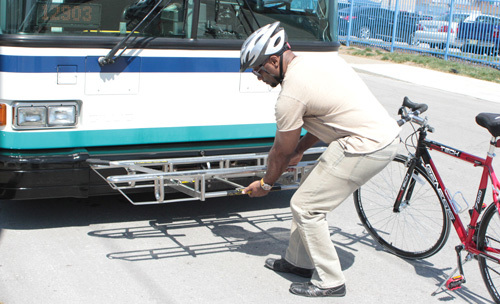 If only the slot nearest to the bus is open, load your bike from the curb, rolling it into the rack. 4. Raise the bike support arm over the front wheel, just past the highest point of the tire. The arm should rest on the tire, not the fender. Please do not lock your bike to the rack with a bike lock. 5. After your bike is secured to the rack you’re ready to board the bus. Pay the required fare, but remember no extra fare is required for using the bike rack. 6. When getting off the bus, be sure to tell the RideKC operator that you need to remove your bike, then exit through the front door. 7. To unload your bike, release the support arm and lift the bike from the rack. Once the rack is empty, squeeze the silver handle to return it to the upright position. 8. For your safety, please remain on the sidewalk until the bus leaves the stop. 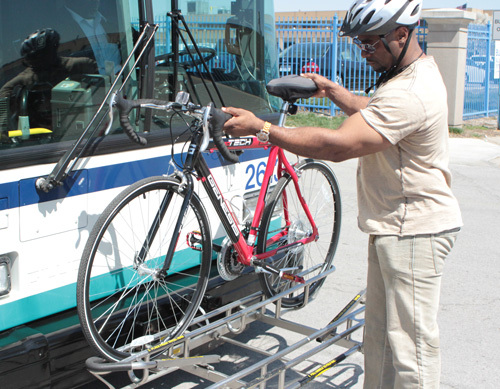 For the safety of other passengers, bus operators cannot assist with loading or unloading bicycles.